Nov. 1 – Lindsay Shepherd plays a clip from TVO’s The Agenda, which showcases a debate featuring controversial University of Toronto professor, Jordan Peterson, discussing “genders, rights and freedom speech.” Ensuing the clip was a class debate surrounding the use of they as a pronoun. The class she showed it in was a first year tutorial for a course named Canadian Communication in Context. Nov. 8 – Shepherd is called in to a meeting with her supervising professor, Nathan Rambukkana, assistant professor in communication studies at Laurier, Herbert Pimlott, associate professor in communication studies at Laurier and Adria Joel, manager of gendered violence prevention and support (acting) at Laurier’s Diversity and Equity Office. Nov. 10 – 8:42 p.m. – “Christie Blatchford: Thought police strike again as Wilfrid Laurier grad student is chastised for showing Jordan Peterson video” story is published on National Post. Several major publications in Canada followed suit in condemning the university’s response. Nov. 14 – Laurier professor William McNally launches a petition on Change.org named “Free Expression at Laurier”. “It is our view that the university community would be best served — and would live up to its own values and mission statement — by enshrining, in writing, a commitment to protect maximally free expression, critical inquiry and open debate,” the petition states. It also goes on to claim that “It is axiomatic that intellectual inquiry, critical reflection and scholarly integrity are NOT POSSIBLE in an institution that prevents some ideas from being articulated. Any censorship of ideas, no matter how repugnant some may deem them, prevents Wilfrid Laurier University from meeting the chief values, or “cornerstones”, required to function as a university.” The petition has over 1000 supporters. "Laurier would not confirm what discussions have taken place with Shepherd, but say they have asked an unidentified "neutral third-party professional" to "gather the facts" of the case." Re: those claiming I have a right-wing agenda: Unfortunately, you have missed the point. Freedom to circulate ideas and debate current affairs is everyone's issue. I am a leftist. But I do not represent the leftism of Rambukkana/Pimlott, who believe in shutting down opposition. She quickly amassed a large following (over 18000 at the time of publishing). Nov. 20 – evening – The recording of Shepherd’s reprimand is acquired by The Cord and the mainstream media after Shepherd shares it with Global News. During Scheer’s Campaign for leadership he made the following promise: “As Prime Minister, I will ensure that public universities or colleges that do not foster a culture of free speech and inquiry on campus will not receive federal funding … In order to be eligible to apply for grants, public universities must pledge to uphold the widest possible free speech rights on their campuses and their record of fostering free and open speech on campuses will be considered as a factor for eligibility as well”. Early afternoon – student appears on campus with protest sign saying “Lindsay Shepherd deserves an apology”. The WLU Rainbow Centre in turn posts a sign to their office window saying “Trans students deserve an apology”. 1:44 p.m. – an email containing written apologies from Laurier President, Deborah MacLatchy, and professor Nathan Rambukkana was sent out to all Laurier students. Nov. 22 – Andrew Scheer brings the controversy involving Lindsey Shepherd to the attention of the House of Commons. Nov. 23 – 11:47 p.m. – Deborah MacLatchy releases a video statement doubling down on the sentiment expressed in her open letter. This petition currently has over 350 supporters. 12 p.m. – A free speech rally organized at Victoria Square in Brantford by student, Christian Mejia, in support of Shepherd is disrupted by counter-protesters. 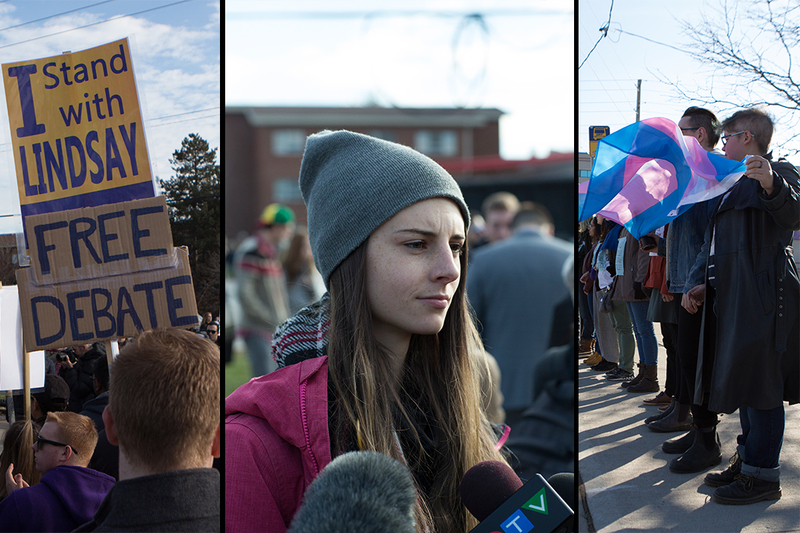 1 p.m. – A simultaneous protest takes place at University and Hazel in Waterloo. The protest is supported by several students and faculty members. The protest is also attended by Lindsey Shepherd, among other guests, who spoke to address the crowd. Organizers of the protest motioned for Wilfrid Laurier University to update their policy on freedom of expression. Shortly before the protest was set to begin, a counter-protest organized across the street. Nov. 27 – Shepherd appears on Radio Laurier for a live interview with The Cord’s News Director, Safina Husein, available in full below. For a more in-depth look at the issues at hand, check Safina’s feature article on the topic here. Nov. 29 – A letter addressing graduate and undergraduate students at Laurier is released by the Students’ Union and the Graduate Students’ Association. Among other things, the letter states the following: “Over the coming weeks and going into next semester, our goal is to facilitate sessions for students to ensure all voices are heard. We will then compile the feedback and articulate it to the committee to assist in the process of achieving their mandate.” To read the letter in full, click here. Nov. 30 – 8 p.m. – Deborah MacLatchy appears on The Agenda with Steve Paikin to discuss the events that have unfolded on campus in a segment titled “Academic Freedom at Laurier.” The Agenda is the TVO program that originally aired a debate featuring Jordan Peterson, which is at the centre of this controversy. Dec. 5 – A second open letter from Laurier staff is published online on LSPIRG’s Facebook page. Among other things, the letter asks that the school name transphobia as a problem and officially address its pervasiveness on campus in relation to recent events and beyond. The letter also asks the school to postpone the assembly of a task force, noting the following: “We need to reflect upon the mandate, purpose and composition of this task force, and indeed, if it reflects the needs of the broader community.” The full letter can be read below. Dec. 6 – 11:04 a.m. – A letter is sent out by CPAM with the subject line “A message from the President and Vice-Chancellor, Deb MacLatchy”. Recent events have caused some people to question Laurier’s support for our LGBTQ2 campus community, and transgendered people in particular. We are proud of Laurier’s record of celebrating all aspects of diversity. The presence, visibility and voices of our lesbian, gay, bi, trans, queer and two-spirited students, faculty and staff enrich our campuses in immeasurable ways. We will continue to make our campuses welcoming and engaging places for all people and all identities. In the past weeks, we have created and communicated additional supports for students, faculty and staff, and added measures to improve campus safety. There is no place at Laurier for bigotry, discrimination, intolerance or marginalization. Laurier’s support for our LGBTQ2 campus community is resolute and unshakable. We are grateful to the many people who have reached out to us about this important matter. On behalf of the Executive Leadership Team of Wilfrid Laurier University, thank you for your commitment to making Laurier a better place. Dec. 7 – 12:00 p.m. – A Trans Solidarity Rally is held in the Quad on campus in Waterloo, drawing support from students, faculty and staff alike. To read more about the rally, click here. Dec. 8 – In a letter to Shepherd’s lawyer, it is suggested that no formal complaint was ever filed. Afternoon – President of Laurier, Deb MacLatchy, issues a statement addressing the results of a fact-finding committee assembled to dig deeper into Lindsay Shepherd’s reprimand. Though the findings of the committee are confidential, she addresses some of the more important points made throughout the document. To read the statement in full, click here. The trio discussed various details and aspects of Shepherd’s situation, including the two sides of a firm debate between free speech and trans rights which have emerged as a result of the situation. For more in depth coverage of the video, click here.